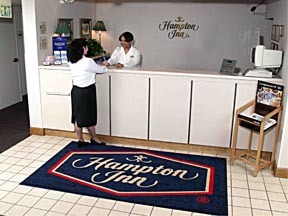 Enhance the image of your business with a Classic Impression logo mat. No art charges or set up fees. Simply provide us with a business card with your logo on it and we will handle the rest! Static dissipative nylon yarn with Stain Stopper Technology. Reproduction of fine detail, fades and 3-D images.